Obesity and metabolic syndrome are increasing global health problems. In addition to the malnutrition of a sedentary lifestyle, high calorie intake leads to obesity with many negative health consequences. Macrophages infiltrate adipose tissue and induce chronic inflammation by secreting pro-inflammatory cytokines, including COX-2 and iNOS, among other mediators of inflammation. Free fatty acids mediate adipose tissue signalling through toll-like receptor 4 and the expression of these pro-inflammatory mediators via NF-κB or JNK. PPAR γ activators can inhibit the activation of NF-κB, down-regulating the expression of pro-inflammatory cytokines. Here we provide an overview of how different culinary herbs and spices exert anti-inflammatory activities and the extent to which they activate PPAR α and PPAR γ, inhibit the activation of NF-κB, and enhance expression of anti-inflammatory cytokines. Spices can play essential roles as anti-inflammatory agents in our diet, acting as pan PPAR activators and improving insulin sensitivity, counteracting dyslipidaemia and weight gain. The effects of chronic inflammation caused by obesity are counteracted and, consequently, the progression of diseases associated with chronic inflammation slowed. Sheila G. West, PhD, is professor of biobehavioral health and nutritional sciences at The Pennsylvania State University, University Park. Ann C. Skulas-Ray, PhD, is a research associate in the department of nutritional sciences at The Pennsylvania State University, University Park. Traditional risk factors for cardiovascular disease (CVD) include high blood low-density lipoprotein (LDL) cholesterol, low high-density lipoprotein (HDL) cholesterol, high blood pressure, smoking, and diabetes. Family history and inflammatory factors also affect CVD risk. Diet therapy for treating and managing patients with CVD and for reducing risk among healthy individuals focuses on consuming a diet containing vegetables and fruits; eating whole-grain breads and cereals; choosing poultry, fish, nuts, legumes, and low-fat dairy foods; and limiting the intake of saturated fat, trans-fat, sweets, sugar-sweetened beverages, and red meats.1Because spices and herbs are rich in potentially bioactive compounds, clinical studies have examined their effects on blood insulin, blood lipids, and inflammation. Spices and herbs are rich in compounds that may reduce inflammation and improve blood factors associated with increased CVD risk. However, the body of literature regarding their effects is small, and the clinical findings are not always consistent. The vascular effects of spices and herbs and their efficacy and safety relative to traditional drug therapy represent an exciting area for future research given the public health significance of CVD. Spices don't simply add flavour to your food - they also aid digestion, protect against bacteria and prevent a range of illnesses Spices generally add a more pungent taste to foods. Wherever possible, it is best to buy the whole spice and grind or crush it yourself. This way the aroma will be stronger and you will benefit from more of the active ingredients. As food activist Vandana Shiva has pointed out, unlike buying pineapple chunks from impoverished Ghanaian farmers or green beans from rain-starved Kenya, buying herbs and spices that are legitimate indigenous agricultural products is a good way to invest in developing countries and to give them access to the world market without destroying their food cultures in the process. Our appreciation of the taste and smell of food actually begins in the womb. Not only does what you eat provide the building blocks for your baby’s growth, it also provides, quite literally, a taste of the environment it will be born into, since amniotic fluid becomes flavoured according to what the mother eats. In this way it is thought that babies become acclimatised to the food preferences of their culture. While herbs are the leaves of herbaceous plants, spices come from the other parts of the plant, such as the bark, root, bud or berry. 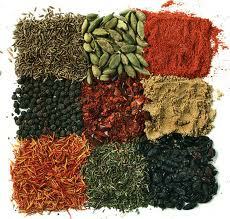 Unlike fresh herbs, spices are generally used in their dried form. This means their essential oils content is highly concentrated, and if stored properly - in airtight containers, away from light - they can keep their pungent odours for a very long time. There are a wealth of spices you can use to make meals more appealing and many of these are also commonly used for their healing properties in traditional medicine. Caraway has traditionally been used to aid digestion and relieve wind. Sprinkle fresh leaves over cabbage, potato and beetroot dishes. If you bake your own bread, particularly rye bread, add this to the mixture. Add also to soft cheeses to make an unusual sandwich spread. If you grow your own, you can also eat the tap roots as you would parsnip. Cardamom is a good digestive stimulant and diuretic. It is effective against H. Pylori, the bacterium that causes ulcers, and may help to prevent atherosclerosis. Buy the whole green or bleached white seeds to use, lightly crushed, in rice dishes, curries and meat stews. Freshly ground cardamom can give a surprisingly tangy lift to an everyday fruit salad. It can also be infused in milk to make a spicy custard or rice pudding. Cinnamon is a first-class antiseptic and digestive aid. It is rich in antioxidants, which may be why one of its traditional uses is to aid recovery from colds and flu. There is some evidence that cinnamon is useful in helping to normalise blood glucose levels. It is equally nice in savoury dishes, such as stews, stuffings, pickles and relishes, as it is in sweet dishes, such as stewed fruits and pies. It’s lovely mixed with sugar on hot buttered toast and can be used to spice up rice or milk puddings. Try using a cinnamon stick to stir hot chocolate or milky coffee. Coriander can stimulate appetite, help increase secretion of gastric juices and aid digestion. It is traditionally used as a diuretic and is a strong antibacterial shown to be effective against salmonella. The seeds can be used in curries, chutneys, stews and soups. They blend well with smoked meats and game and even fish. Ground coriander seeds also add a nice dimension to breads, desserts and sweet pastries. Cumin is a good general tonic. It is antiseptic, antibacterial and is reputed to help improve circulation. It has antioxidant properties and studies show it can inhibit the growth of cancer cells, at least in the lab. It can be delicious added to a marinade for barbecues or kebabs. You can make a spicy eastern-style salad with tomatoes, green peppers, courgettes and/or aubergines, with a little powdered cumin sprinkled on top. Use the whole seeds in pickles or preserves. Ginger can be used to combat nausea, vomiting and morning sickness. It can be as twice as effective as Dramamine in preventing motion sickness. It is antiseptic and also full of antioxidants. Its anti-inflammatory effects make it useful in treating arthritis and post-exercise stiffness. It is a digestive aid and can relieve symptoms of sore throats, colds and flu. Ginger is as good on ice cream as it is in a casserole. It is also tasty in pickles and cheese dishes, and can be used effectively in all forms of baking, particularly cakes and breads. Juniper berries are detoxifying and effective in combating rheumatic conditions such as arthritis. Juniper is traditionally used to aid digestion. It is an effective diuretic and can treat urinary tract infections. The fresh berries are best lightly crushed and cooked with meat and game. Used with garlic and sea salt they are a wonderful accompaniment to cabbage and other green vegetables. Juniper can also be used in a variety of stuffings, sauces, marinades and pâtés. Nutmeg acts as a stimulant, tonic and digestive. It can be beneficial for convalescents and those who are over-tired, can ease wind and is reportedly good for the heart. It is also reputed to be an aphrodisiac. Use in milk and rice puddings, and in white or cheese sauces. Nutmeg can transform mashed potatoes and other vegetable dishes. Sprinkle over hot chocolate or warm milk for a quick pick-me-up. Peppercorns come in green, black, white and pink, and are actually a fruit. Pepper aids digestion and stimulates appetite. It has antioxidant and anti-inflammatory properties, and is traditionally used to aid detoxification, to ease lung and bronchial infections, and relieve shock and stress. Use in savoury stocks and marinades, and liberally over salads and hot vegetable dishes. Coat meats thoroughly before grilling, and add crushed peppercorns to vinegars and oils to make spicy dressings. Always buy whole peppercorns and grind as required. Pre-ground spice quickly loses its active properties. Star anise is traditionally used to ease wind, hiccups and fluid retention. It may also have antiviral properties that make it useful against flu (in fact, it is the starting material for the drug Tamiflu). Star anise has a spicy, liquorice-like taste. The seeds go particularly well with figs. Add a bit of ground star anise to ground coffee before brewing or to some vanilla-flavoured yogurt. Use the whole spice or the seeds with fish and in vegetable dishes, soups, rice dishes and curries. 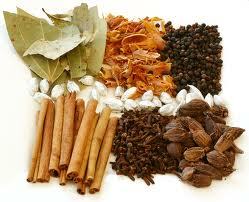 Directions are included for both whole spice chai for tea and powdered chai spice for cooking. The cooking blend is good in oatmeal and for adding to baked goods such as cookies, pumpkin pie, quick breads and cakes. Start by adding a teaspoon per batch and increase until you have just the right combination that pleases your palate. Once you develop a recipe adaptation that you like, you can make a gift of the recipe and a small jar of the Chai Spice to your friends who cook. The chai tea blend also makes a great gift. Just remember to include directions. Lightly crush each of the following ingredients with a mortar and pestle. Combine and store in an airtight container in a dark cabinet if you use dried ginger. Or you can store all but the ginger and add fresh when you make the chai. *To dry ginger, preheat oven to 300 degrees. Peel and coarsely chop as much ginger as you need. It keeps well so you may want to do more than you actually need for this recipe. Spread on a cookie sheet and place in oven for 15-20 minutes. Keep an eye on it and turn it a time or two so it doesn't burn. To make a batch with the entire concentrate above, the traditional method is to simmer the spices, sweetener, and tea in the milk for at least 30 minutes. Alternately, you can simmer the spices and sweetener in the milk for 30 minutes and steep the tea in the chai for about 3 minutes once it is taken off the heat. Another option is to simmer the spices and sweetener in 4 cups water for 30 minutes, steep the tea in the finished chai and add a small amount of milk or milk substitute to taste. Whether you use milk or water, the brewed chai will keep in the refrigerator for a few days. Just add the tea when you reheat it. Sprinkle a little of this blend on oatmeal as you would cinnamon. Experiment with baked goods that usually have one or more of the ingredients in this blend or a recipe that you like but think is a little bland. It is especially good in pumpkin pie with an added 1/8-1/4 teaspoon ground cayenne pepper. It just gives the pie a little spicy surprise!